Ilya Repin, "Barge Haulers on the Volga" 1870-73. Brussels World Fair U.R.S.S. Pavilion, 1958. 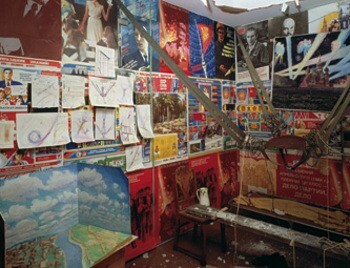 Ilya Kabakov "The Man Who Flew Into Space" 1981-88. The line which snaked down Fifth Avenue and around the corner under a specially built protective canopy inched along slowly on a balmy Sunday afternoon last fall. The preferred language and pervasive ethnicity of the queue was Russian. The exhibition rovided a dense overview of 250 national treasures of painting and sculpture covering the past 900 years from icons to conceptual art. That is not enough work to cover a broad range of time and history. In such an abbreviated form is there any real possibility of a coherent overview and coming to insights as to national identity, style and character? There is too much of a tendency (on the part of museum directors and curators) to assume that you will walk away with such notions and impressions. Encyclopedic, blockbuster museum shows are strong on highlights and weak on insights. Unless you wade into catalogues as dense as phone books. They tend to compile and hint at issues and ideas more than develop and resolve them. For scholars they are perhaps more useful as a starting point and reference. The problem is that everything; good, bad and ugly, brilliant and enervating, get equal time and space. In a single overview visitors are given a sense of what is Russian about Russian art. What is American about American art used to be a familiar question. The answer increasingly appears to be not that much. It is a question that has gone out of fashion. The notion of treating and teaching art within such nationalistic confines has given way to the approach of globalism. There was a time when the movement of Luminism, or American landscape painting just before and the decades after the Civil War, was viewed as a uniquely American phenomenon. In 1984, Robert Rosenblum and H. W. Janson published “19th Century Art.” The publication provided a global view of the field with many previously unknown artists and movements. It included works by Russian and Danish artists which compared to the American Luminists. The term has fallen out of currency replaced by The Glare Aesthetic. In the Guggenheim exhibition we get to see some of the actual works that Rosenblum published in the 1984 text. That part of this exhibition proved to be both less and more than what I had anticipated. Overall, based on a very limited sample, 19th century Russian art, with some notable exceptions, proves to be neither more nor less interesting than American Luminism or the narratives of French salon painting. You didn’t walk away with a compelling urge to learn more about specific masters. There were some interesting works but nothing earth shattering. The work conveyed a sense that technique and finish as well as narrative content had trumped ideas and experimentation. Overall there was a strong indication that from the time of Catherine the Great (1729-1796) Imperial Russia looked to Italy and France for paradigms for art and architecture. It is significant, for example, that in Count Leo Tolstoy's "War and Peace" the aristocrats spoke French. Russian art did not develop an unique identity until the the October Revolution of 1917. In his essay for this catalogue Rosenblum discusses the “isms” of Realism and Symbolism. “The first of these two isms embraced the visible, empirical world (as Gustave Courbet said ‘Show me an angel and I will paint it.’) The second drifted into a world of inner experience, whether of private emotions or dreamlike fantasies, an internal realm that could be expressed (as was the case with the earlier “ism” Romanticism) in the most diverse spectrum of styles and imagery, as reflected throughout the art of the later nineteenth century in the United States, Denmark, Italy and Russia.” Since this notion was first set forth in 1984, one would have hoped that Rosemblum would be prepared to offer more on his theory. He used this occasion to repeat prior information. His essay offers no new insights but more vivid examples. There is another issue with blockbuster, nationalistic surveys. They tend to backload from a moment in time, or movement, when the culture does indeed produce something of epic importance. This was evident, for example, in the Guggenheim’s “Brazil” from 2001. That was truly over the top particularly its Catholic kitsch from the Colonial era. But there was a moment of great and riveting originality in the Bossa Nova era of the 1970s when the culture flowered in the constructivism and conceptualism of its artists. There was a riveting glimpse of abstract work that continues to command attention. The concept informs the “Russia!” exhibition. It is only when we have spiraled up the ramp of the Guggenheim to the era of the Russian Avant-garde (1910-1934) that we have a true and compelling reason to be there. Everything before and after pales in insignificance and fades to black. It is in a handful of works by Malevich, Rodchenko, Chagall, Popova, Tatlin, Goncharova, Rozanova, Filinov and Kandinsky that the brilliance and originality of that heroic, revolutionary, tragic generation comes to light. So the exhibition becomes a time line of what led up to, coexisted with, and followed one of the truly remarkable moments in modernism. The Russian avant-garde came to a sudden end following the death of Lenin in January, 1924. The subsequent rise of Stalin initiated a purge of the avant-garde leading to National Socialism as the official aesthetic in the arts. Our knowledge of that brilliant movement of art has been played out in increments which continue to unfold. In this history the Guggenheim has provided a vital role. It started in 1981 with “Avant-garde Art in Russia: Selected Works from the Kostakis Collection.” Between 1930 and 1960 George Kostakis, a Moscow resident of Greek descent, amassed a collection of more than 2,000 works from the period 1910-1934. Through negotiation with Russian authorities he later emigrated with just over half the collection. The 1981 exhibition represented the first critical mass and scholarly text of an era of art still largely unknown to the world. Many museums coveted the material. Eventually, according to his wishes, the entire collection of 1,275 pieces was purchased from his daughter, Aliki Kostaki, for the Thessaloniki State Museum of Modern Art in Greece for 14 billion drachmas. The material is particularly rare and valuable because modernism was denounced as counter revolutionary by Stalin. The tales of risk and heroism on the part of museum directors and curators are harrowing. This exhibition has a sub theme devoted to the prescient modernist collections of Ivan Morozov and Sergei Schukin. Their collections, in the case of Schukin, the very finest of early Matisse, were confiscated for the Hermitage. Under Stalin and his cultural thugs they were never shown and risked destruction. In a recent documentary one was absorbed to hear an elderly woman curator at the Hermitage relate how she stood up to authorities. In defense of saving the work, now a national treasure and tourist destination, she produced a quote from Lenin stating that the two collections represented a great teaching resource for the people. It was enough to silence her interrogators. In 1992 the Guggenheim focused on that era with “The Great Utopia: Russian and Soviet Avantgarde 1915-1932.” That enormous exhibition included all aspects of agit prop from film and posters to books and graphic design, architecture, machinery as well as painting and sculpture. More than Utopia it conveyed a sense of Euphoria. That somehow we were all going to be comrades, design, build and live in a better world. That was followed by “Amazons of the Avant-garde” in 2000 and “Kazimir Malevich: Suprematism” in 2003. My personal introduction to Soviet art and culture occurred at the 1958 Brussels World Fair. 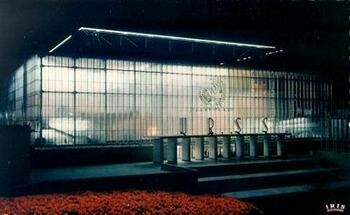 The pavilion of the U.R.S.S., as was emblazoned above its entrance, consisted of a large, two storied, glass box. Flanking the steps leading to the exhibition hall were enormous bronze sculptures of peasants holding sheaves of wheat bracing against what appeared to be a powerful wind. I was puzzled by why farmers were presented in such a grand and heroic manner. I had never seen figurative sculpture on such monumental scale. Inside, the ground floor displayed machinery and what seemed to be terribly out of date designs for automobiles and trucks. There were mannequins draped in furs. It all seemed so ludicrously bad it was hard to fathom why they were serious about this. On the second level was a broad, square balcony where one could look down on the machines. Along the walls of this area were works of art. There were portraits of peasant with medals for growing the most potatoes. Was there ever a more boring subject for an artist? Or elaborately depicted renderings of Soviet athletic accomplishments. There were depictions of comrades crossing the finish line at the Olympics in a dated post impressionist style. I thought about that Brussels Pavilion in July of 1959 when Richard Nixon famously engaged Soviet Premier Nikita Kruschev in the “Kitchen Debate” during an exhibition of the American home in Moscow. It seemed to express everything that was different about us. It earned Ike’s V.P the status of “standing up to Kruschev.” The Soviets had launched Sputnik in 1957 and shot down the U-2 spy plane in 1960. There was a best selling book and TV series by Herbert Philbrick “I Led Three Lives: Citizen, Communist, Counter Spy.” On TV Senator Joseph McCarthy asked “Are you now or have you ever been a member of the Community Party?” Lots of artists were. Many of these "Communists" were my professors at Brandeis. There were glimmerings of the work of that era and style in the current exhibition. But, of course, the very best examples. Which hardly made them any less ludicrous. Overall this exhibition made me speculate as to whether, with some notable exceptions, the notion of Russian Art is an oxymoron. About 80% of what I viewed at the Guggenheim, especially the 17th and 18th century Imperial portraits, pretty much sucked. Yes, I did have an epiphany before three vintage monochromes by Rodchenko. One concludes that Russia's greatest achievements were not in the visual arts. The works seen here are not on a par with Russian music, dance, literature, film and theatre. With the exception of its all too brief explorations of abstraction and the avant-garde it is a visual culture in which the fine arts strive to tell stories through pictures. This is also true in the contemporary work of Komar and Melamid, Ilya Kabakov, Igor Makarevich, Vladamir Yankilevsky, Eric Bulatov and Leonid Sokov. Contemporary Russian art needs to evolve for another generation. Yes, there was the great thaw of the post Gorbachev-Yeltsin era. And there were interesting results of breaking away from the official restraints of the old U.S.S.R. But let us not loose sight that Russian art and culture exists under the regime of Vladimir Putin, a former head of the K.G.B. How can the arts thrive under such constraints? The new agit prop is struggling to break away from the old agit prop. We look forward to another Great Utopia.